I have been listening to the debate over the proposed immigration bill for several weeks. The bottom line is that supporters say they must do something about immigration. Their basic argument in support of this law is that the current system is broken. Supporters argue that this bill will fix the problem. They say trust us, we will replace the laws that aren’t enforced now with more laws that have no enforcement mechanisms. We make all illegals legal and then there is no problem. I have heard members of Congress, administration officials, staff from The Wall Street Journal and others claiming to support the bill try to argue in favor of this legislation but they cannot cite why this bill is better than current law and more importantly how this law will fix the problem of illegal immigration once and for all. The bill’s supporters are utilizing emotional arguments both in favor of the bill and also to attack its opponents. Anyone that opposes this bill is a racist, bigot, Nazi, xenophobe. Facts are not relevant to this discussion. I have not heard a single person who says that they favor the bill try to argue the merits of the legislation by citing chapter and verse from this wonderful compromise worked out in secret. Ultimately supporters claim that President Bush will sign it so it must be ok.
What a joke! President Bush will sign anything that Congress gives to him no matter how bad, unconstitutional or fiscally irresponsible. He holds the all-time record for the fewest vetoes of any President in history. He has vetoed only one bill and that was after almost six years in office! I am in favor of immigration by legal means. I wish the numbers allowed were at least doubled if not tripled from what they are now. Let folks in legally; lots of them. 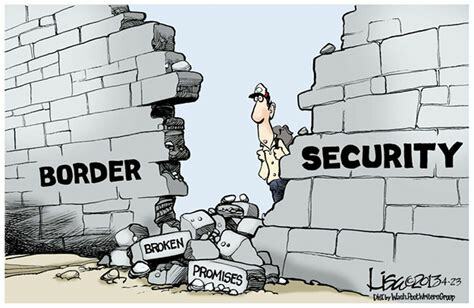 The bill’s approach of granting blanket amnesty to all illegals is a national security nightmare. There is no agency assigned to do background checks, no money to hire manpower for the checks and no responsible agency assigned by the legislation. 24 hours for a background check and then a visa that will be good for the rest of your life is just stupid. What database will be used for the check? If we can’t even stop the Virginia Tech shooter from buying firearms through legal means including a background check, why do we think we will catch some terrorist from Jordan before he is given legitimate papers when twenty million people try simultaneously to get their background checks? We have had a check-in/check-out law on the books for eleven years for legal visitors and it still does not work. The FBI and Department of Homeland Security have had major computer issues since the 9/11 attacks. Now the same people who created and funded these notable computer failures think we can create a nationwide system from scratch in 18 month that will screen people from every corner of the globe! There needs to be as much time as necessary to do the background checks. The visas much have expiration dates and renewal requirements. We need to secure the borders before any regularization program for illegals is adopted. The cornerstone of making the system work needs to be employer verification. Only one or two forms of identification should be allowed for employment. These identification documents must be verified by the government prior to employment. If employee information is suspect either at hire or due to errors later found by the Internal Revenue or Social Security Administration, the employer needs both the legal right to terminate and the legal protection not to be sued by some ACLU type if they do. If the borders are secured and the employer is empowered to check-up on new hires, the economic draw for illegal immigration will be drastically reduced.